Tonight's supper. Plain ol' easy comfort food. I know, I know, people get freaked by eggplant sometimes, I think. In this recipe I 'salted' and drained the eggplant cubes (see recipe) so they aren't supposed to be as bitter. 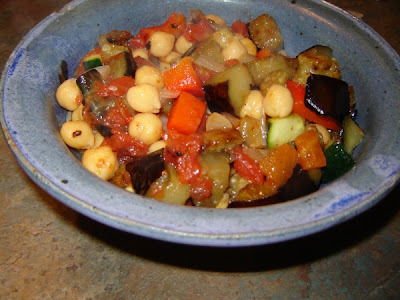 I add garbanzos/chickpeas for a little protein and usually serve over couscous or quinoa. Oh - and the blue bowl? I made it in a pottery class in college. It's my favorite "comfort food" bowl, wide, deep and easy to hold. Cube the eggplant, toss with the 1 Tbsp. salt and put in a colander for 20 min. In a large frying pan, place the olive oil and saute the onion. Add the bell pepper and zucchini. When they begin to soften, add the garlic and raw tomatoes. Rinse eggplant cubes and drain/blot well on a paper towel. Add eggplant to frying pan. Add the seasonings, garbanzos/chickpeas and enough stewed tomatoes so the vegetables don’t stick to the pan, but not so much that they are swimming in liquid. Cook until vegetables are done to your preference. I admit it. I have tried to love eggplant but just can't. Your dinner looks so good though! I would make it and pick out the eggplant. Yet another yummy recipe that I have to try. This looks like a new favorite to me. I love eggplant! This sounds very good! Ratatouille was one of our favorites growing up. In fact, I ate ratatouille on my wedding night! the ratatouille looks delicious, I think I have all the ingredients. will surely try this. I love ratatouille! But I can never get it to taste quite like I want when I make it, I think partly because I never want to use as much oil as the recipe states!! I have to admit that it's the only kind of vegetable thing that I would buy in a can. I used to buy it all the time in the UK, but I have never found any here in the US :( I will need to try to make it soon...thanks for the recipe! I just wanted to let you know, I tried your Cashew Alfredo Sauce and it was wonderful! I posted about it on my blog along with a link back to you so that everyone will know where to get more fabulous recipes like that one. Thanks for the great recipe. the dinner looks very good too!